While many observers have applauded the spontaneity of the Umbrella movement, it is important to pay attention to a set of societal networks and mechanisms that enabled its grassroots mobilization. Besides the pro-democracy political parties and community-based pressure groups, Hong Kong Christians played a visible role in the democratic struggle. Since early 2013, several Christian nongovernmental organizations had been involved in the Occupy Central with Love and Peace Campaign, a civil disobedience movement that demanded direct democracy in the elections of the territory’s chief executive and lawmakers. The organizers of Occupy Central are Christians including the well-known Baptist pastor and prodemocracy activist, Rev. Chu Yiu-Ming (Ngo, October 27, 2014). Shortly after the tear-gas attacks on September 28, a few downtown churches opened their doors to the protesters. One evangelical pastor estimated that over 50% of the roughly 1,400 Protestant churches in the territory had organized ad hoc groups to support “demonstrations, with prayer groups, crosses, and protesters reading Bibles in the street” (Levin, October 3, 2014). 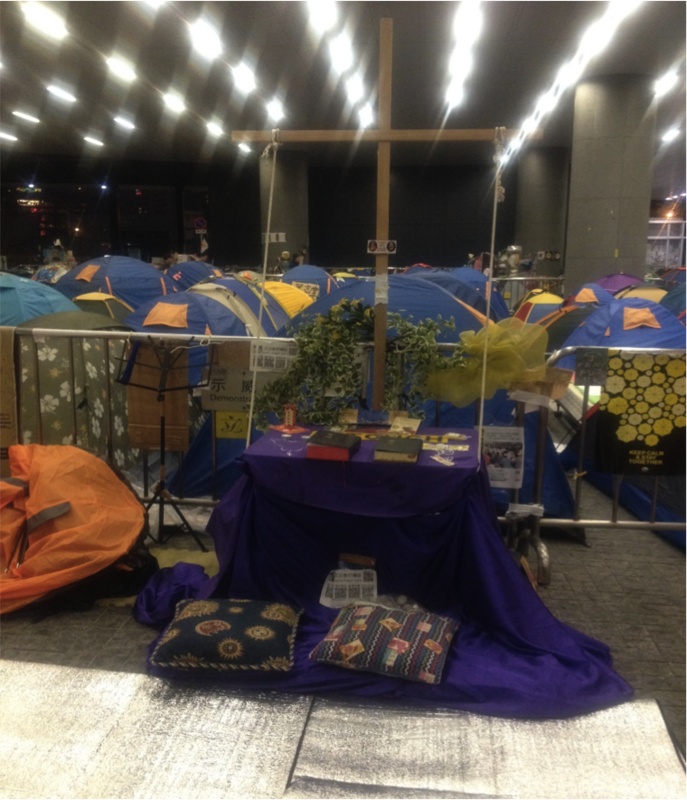 Before the Hong Kong police moved in to clear the protest site in Kowloon’s Mong Kok district in late November, several Anglicans, Catholics, and Evangelicals set up an outdoor St. Francis chapel, holding daily worship and prayer meetings in public, and posting the Catholic and Protestant versions of the Lord’s Prayer. It was profoundly moving to see the religious faithful who performed sacraments on the streets day after day, acting out their Christian piety toward each other and handing out food and water to other occupiers. The self-mobilization of Christians has symbolized the growth of social and religious activism in Hong Kong (Battista, October 27, 2014; Cheng, October 17, 2014). It is precisely this intersection of faith and politics that we try to address with questions about what Christianity meant for the faith-motivated activists who contributed to the political betterment of society, whether Christian values and practices subverted or conserved the culture of political apathy, and whether the churches nurtured resistance or perpetuated submission to Hong Kong’s authoritarian rule. By acknowledging the lived experience of Hong Kong Christians who are navigating the territory’s authoritarian system of governance, our reflection transcends the bifurcation between resistance and subordination, so dominant in the media coverage of Hong Kong, and observes three modes of subtle negotiations between church and state beyond this theoretical dichotomy. First, the Hong Kong Christians’ understanding of faith and politics was largely shaped by their historical experiences of involvement in the turbulence of modern China and of exposure to relative peace and stability under the British colonial rule. The Christians had travelled a long way to emancipate themselves from a culture of political apathy and fear so pervasive in the Chinese Church. Under British colonialism, the Roman Catholic and Protestant churches exercised much institutional influence and enjoyed privileges disproportionate to their overall membership. Being the religion of the status quo, Christianity has long supported and stabilized the colonial regime. This conservative political culture is both a result of the contentious church-state conflicts in China and a transplantation of conservative theology from the West. In the 1920s, the Soviet-supported Nationalists and Communists launched a series of anti-Christian campaigns to cultivate a sense of national unity against imperialism. The secular party activists co-opted Chinese church leaders and mission school students to challenge foreign missionaries. They exploited one political crisis after another to bring the Christians closer to their revolutionary agenda. The radicalization of Christian youths was part of a broader mobilizing strategy to expand the revolutionary movement and to gain popular support for an imagined Chinese nation-state. This secular state-building process became more intensified in the post-1949 era (Lee, 2014). After the Communists seized control of the country, they implemented the aggressive Three-Self Patriotic Movement, in the early 1950s, to co-opt all Christians and take over their churches. As a result, many missionaries and church leaders fled China to Hong Kong, Taiwan, and Southeast Asia, reestablishing their ministries abroad. Against this backdrop, the Christian refugees made up the majority of the Hong Kong church membership in the mid-20th-century. Working closely with the colonialists to develop a kingdom of medical and educational ministries, the Hong Kong churches became the most reliable collaborators and secured the British support of their evangelistic work. Ideologically, the churches remained critical of communism and often found ways to support clandestine religious activities in the Mainland. Yet the connection with the colonialists made the Christians less critical of the absence of democracy in British Hong Kong, and political apathy constituted a significant part of the cultural norms and practices in the sphere of the Chinese church. For a long time, most Chinese pastors appropriated the idea of unlimited submission to Caesar as an excuse for political inaction toward structural injustice. The most notorious example was the Kong Fok Church of the Evangelical Free Church of China, located adjacent to the occupied protest zone in the financial center of Hong Kong. As an upper-class, conservative congregation with many government officials, entrepreneurs and celebrities among its members, the church leadership publicly condemned the prodemocracy movement. During the tear-gas attacks, a number of downtown congregations welcomed those traumatized and injured protesters, but the Kong Fok Church posted a sign that banned protesters from using its rest area. Such a demeaning act betrayed the Gospel teachings on generosity toward strangers, putting that church on the wrong side of history. Nonetheless, as with faith communities elsewhere in times of crisis, the Hong Kong Christians never fully submitted themselves to the worldly authorities. Many conscientious believers led the way in articulating popular demands for freedom and democracy by drawing on their theological convictions to explain and make these universal values easily accessible to the public. According to sociologist Lida V. Nedilsky (2014), a large number of Christians began to contest the terms of political participation in Hong Kong after 1997. The Evangelical Lutheran Church of Hong Kong partnered with human rights lawyers in 1999 to defend the disfranchised Mainland Chinese migrants against the government’s discriminatory policy of public housing allocation (Tam, 2013). In a similar fashion, the Catholic Diocese of Hong Kong refused to identify with the Beijing-supported postcolonial government. During the controversy over the implementation of Article 23 of the Basic Law in 2003, a law designed to prohibit local citizens and organizations from opposing the Communist regime, the Catholics under the charismatic leadership of Cardinal Joseph Zen challenged the Hong Kong authorities over the issues of freedom, democracy, and human rights. A decade later, in late 2014, Cardinal Zen urged the citizens to support the Occupy Central with Love and Peace Campaign. The new level of faith-based activism has provided a fertile ground for the democratic struggles. Second, since the beginning of the Umbrella Movement, the fast-growing political climate had set the agenda for the Church in Hong Kong. Many Christians found themselves in a dilemma, torn between acting out their faith in the public square and fencing themselves against the need to embrace civic engagement. The occupied protest zones provided an ideational space for total strangers to interact in this extraordinary nonviolent movement. In the public domain of worldly and spiritual encounters, some conscientious Christians came together in this unique moment of Hong Kong history. The extreme political forces prompted them to reconcile their spiritual values with civic duties, breaking the old cycle of fear, indifference and apathy. Out of anger at the Christian interventions, some pro-Beijing lawmakers publicly criticized those downtown Catholic and Protestant churches for protecting demonstrators from unprovoked attacks by police officers and thugs (McCarthy, October 15, 2014; Timmons, October 31, 2014). Adhering to the Gospel of justice, the Christians were keen to demonstrate their faith and fulfill their prophetic role in society. Their compassionate acts reflected a theological critique of the authoritarian governance that China has implemented to marginalize the Hong Kong people. One can find much inspiration in the Matthew 7: 14, “Because strait is the gate, and narrow is the way, which leadeth unto life, and few there be that find it.” This biblical metaphor of a narrow gate captures lucidly the ease of following the wrong path toward self-destruction. Evidence of striking defects in Hong Kong’s authoritarian system has shown that the path of corruption is easier to follow than the journey to truth. As some Christians challenged the status quo in an attempt to remake the political order, their activism contrasted with the apathy of pro-government clergymen highlighted the perseverance of the quest for justice. Third, China’s “one country, two systems” has created a suppressive mode of governance through which the political oligarchs and their business cronies have oppressed the Hong Kong people in multiple ways. The postcolonial rulers only considered democratic rights to be exchangeable commodities which they handed out to the people bit by bit, and adopted the managerial system of a market-state to reduce the people’s access to public goods and services. When they applied the logic of economic transaction to control the public domain, their policies favored the rich at the expense of the poor. They ridiculed the entire concept of universal suffrage and treated the people as a faceless mass to be domesticated. One embodiment of this attitude is HSBC (Hong Kong Shanghai Banking Corporation) Holdings board member Laura Cha. She is deeply embedded in the market-state as a non-official member of the Executive Council of Hong Kong, a chairperson of the Preparatory Task Force on the Financial Services Development Council, and a former vice chairwoman of the China Securities Regulatory Commission. Cha gave voice to the anti-democratic sentiments among the elites, justifying the disenfranchisement of Hong Kong people by comparing them to freed African-American slaves and suggesting that they should endure a century of authoritarian rule before getting their electoral rights. These remarks provoked widespread public anger and caused irreconcilable conflict. Ironically, ambiguities and contradictions were embedded in the Gospel from the very beginning. Despite its conservative outlook, Christian pietism instilled a culture of dissent and a glimpse of hope among the believers. In a time of rapid change and uncertainty, many Christians were frustrated with the failure of clergymen to address the public’s concerns about governance crises. They could no longer tolerate that their church leaders still regarded political reflection and civic engagement as taboos. One way to resolve this conflict between church affiliation and personal commitment was to develop the faith-based NGO as “an alternative way of experiencing Christianity” (Nedilsky, 2014: 80). When the Christian activists acted out their conscience in the public square, these experiences had trained them to construct their tactics accordingly. The occupied sites permitted them to live out an ideal Christian personhood outside the supervision of clergy members. Seeing themselves as autonomous individuals, the Christians regained their personhood and cultivated alternative social bonds with other protesters and people of diverse opinions. Such encounters transcended the separations between sacred and profane, private and public, individual and social. The scope of agency for these Christians may be limited, and their efforts to reinvent and rework their political order may not, in the end, defeat the authoritarian system. Nonetheless, this notion of conscientious agency entailed significant elements of dissent. Their struggles not only shifted the old political boundaries and facilitated changes in the future but also challenged their audiences to explore new ways of reimagining hopeless situations and stretching the limited options even within oppressive circumstances. In short, the implementation of China’s “one country, two systems” policy has led to severe tensions and conflicts, which the postcolonial elites have tried to contain and cover up through appeals to economic growth. Hong Kong is now facing the serious problem of governance, for coinciding with its steady growth through integration with China is the political awakening of its citizens and with it the rise of organized activism on an unprecedented level. Seen from this perspective, the Umbrella Movement challenged the Hong Kong Church to reset its agenda and forge itself into a recognizable civic institution. 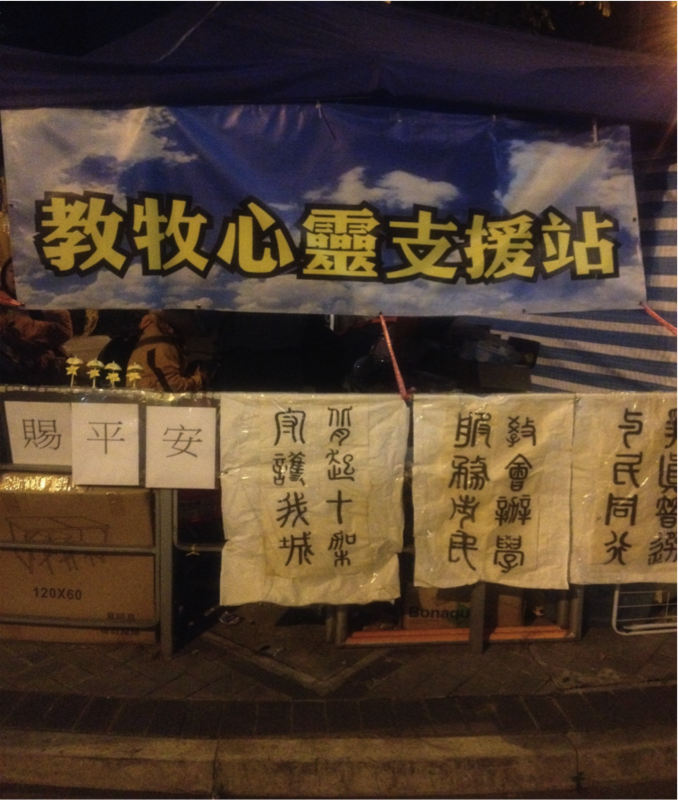 Over the last two months, many Hong Kong Catholics and Protestants set up a shared religious space in the occupied sites, holding daily sacraments and offering spiritual counselling to one another. Such interfaith cooperation was achieved through the deliberate efforts of clergy and laity on the ground, not through endless dialogues among bishops and armchair theologians in the conference rooms. By seeing themselves as part of the disenfranchised majority of the territory’s population and forging an alliance with them, the Christians enacted the essence of the Gospel and re-centered Christian ethics in the mainstream political, social and cultural domains of Hong Kong. Photo 2: A Catholic Shrine outside Hong Kong’s Legislative Council. **Photos taken by Joseph Tse-Hei Lee in the Admiralty protest site on December 8, 2014, three days before the police dismantled the roadblocks and camps on December 11.